This is a popular garden plant that is useful for difficult hot corners of the garden as it will tolerate prolonged drought, although it flourishes with regular watering. 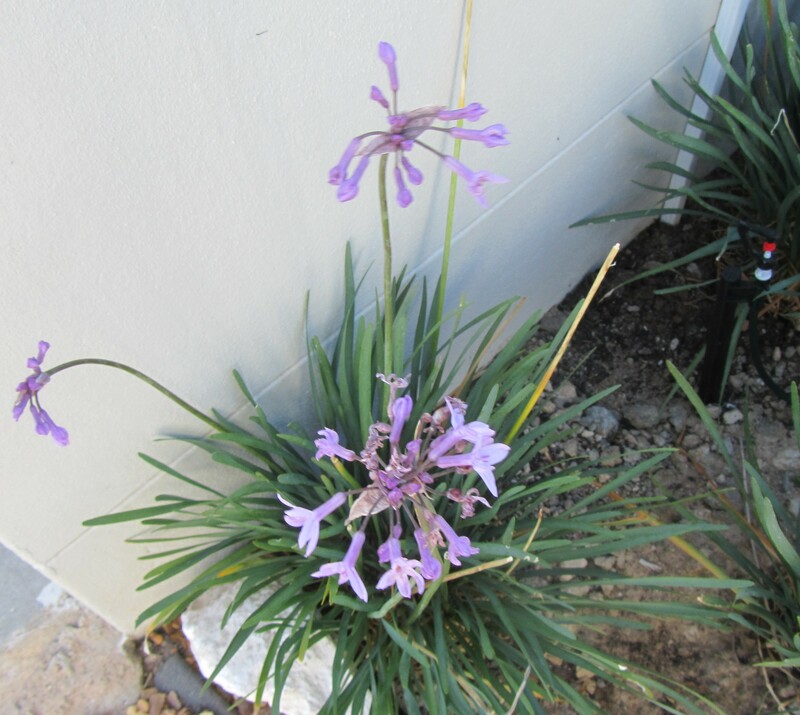 Tulbaghia violacea is a fast-growing, bulbous plant that reaches a height of 0.5 m. The leaves are long, narrow, strap-like, slightly fleshy and smell strongly of garlic when bruised. They grow from fat, tuberous roots which spread to form clumps of plants. The pinkish mauve, tubular flowers, clustered into umbels of up to twenty flowers, are held above the leaves on a tall flower stalk, and appear over a long period in summer (January to April). They too smell of garlic when picked. The fruit, triangular capsules, are grouped into a head, and when ripe they split to release the flattened, hard black seeds. 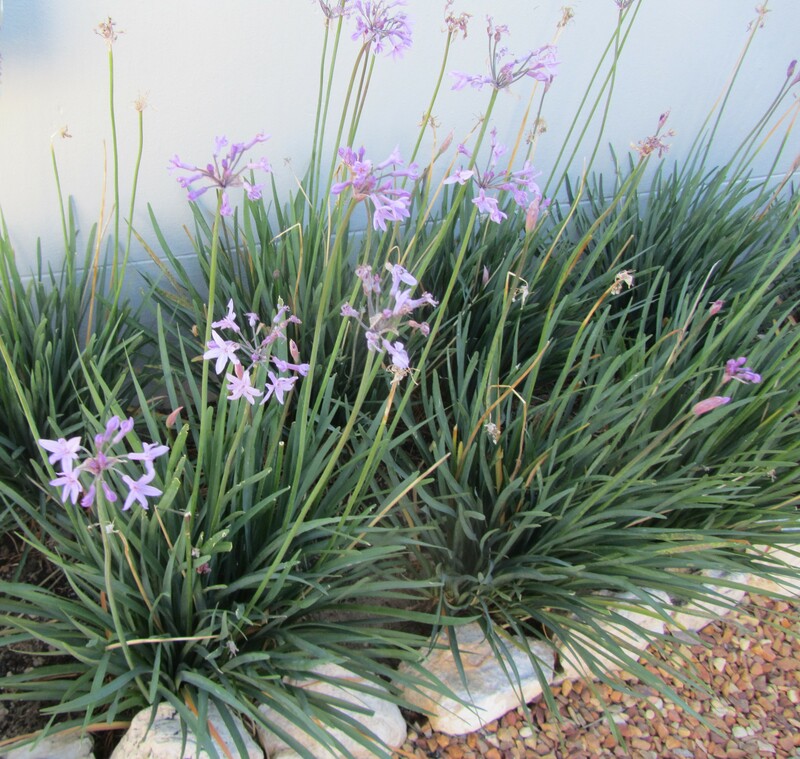 This drought resistant plant stretches from the Eastern Cape, KwaZulu-Natal and Limpopo, to as far north as Zimbabwe. 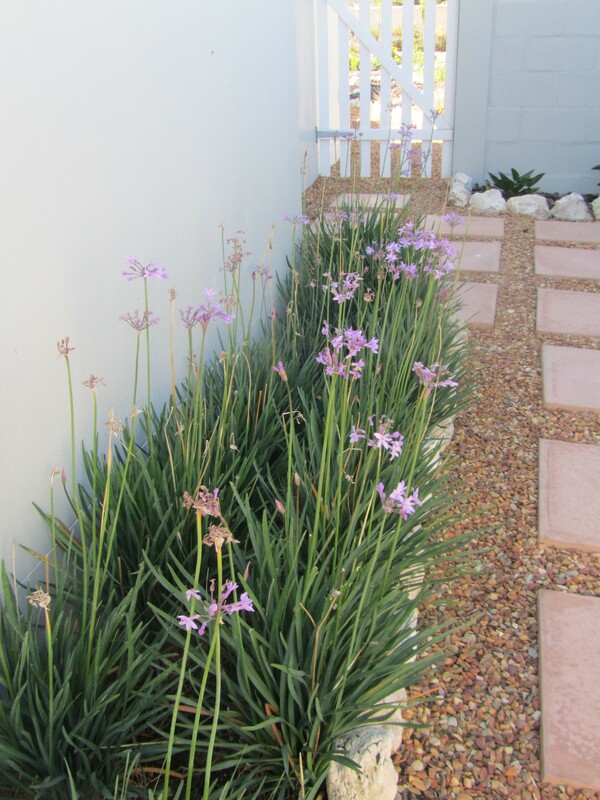 Tulbaghia is named after Ryk Tulbagh (died 1771), governor of the Cape of Good Hope and violacea means violet-coloured. Only two species are grown as ornamentals and enjoy popularity in cultivation. Most of the species of Tulbaghia are adapted for moth pollination and have dull flowers that become sweetly scented at night. T. violacea seems likely to be pollinated by butterflies and bees as they are scented during the day. This attractive plant is ideal for the herb garden, as both the leaves and flowers can be used in salads and other dishes. The crushed leaves may be used to help cure sinus headaches and to discourage moles from the garden (by their strong smell). The smell repels fleas, ticks and mosquitoes when crushed on the skin. The fresh bulbs are boiled in water and the decoctions are taken orally to clear up coughs and colds. The bulb has been used as a remedy for pulmonary tuberculosis and to destroy intestinal worms. Wild garlic may prove to have the same or similar antibacterial and antifungal activities as has been scientifically verified for real garlic. The leaves are used to treat cancer of the oesophagus. The Zulus use the leaves and flowers as spinach and as a hot, peppery seasoning with meat and potatoes. They also use the bulb to make an aphrodisiac medicine. Wild garlic is a very good snake repellent and for this reason the Zulus plant it around their homes. 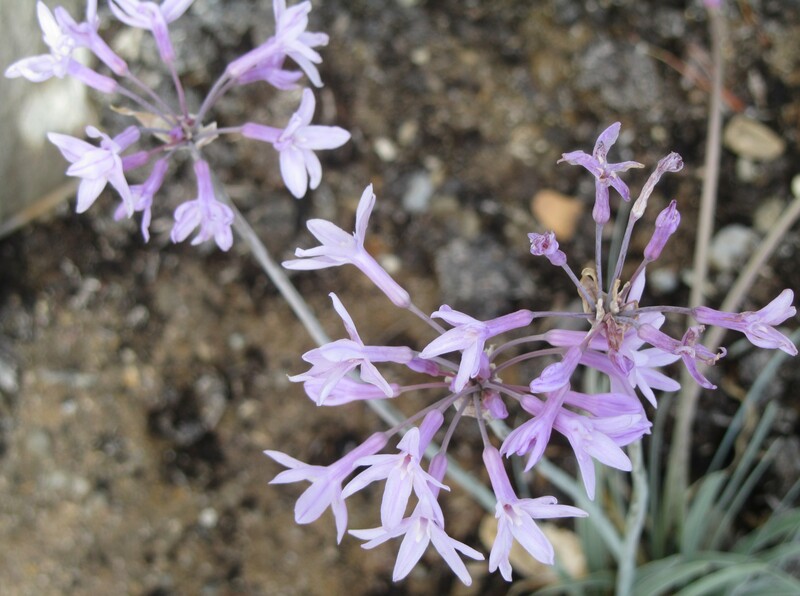 Tulbaghia violacea grows very easily in most soils. It can be used as an edging plant, along a pathway, are displayed to great advantage in a rockery and can also be mass planted to form a groundcover, in sunny or partially shaded positions. It thrives in well-drained soil containing plenty of compost. Propagate from seed or by dividing larger clumps. The hard black seeds are best sown in spring in deep seed trays and can be planted out during their second year. Once the clumps that have been divided are planted, they should be left undisturbed for as long as possible. First flowering can generally be expected in the second or third year. Tulbaghias seldom fall prey to pests and diseases, but slugs and snails can cause considerable damage to the foliage. Many thanks for taking part in the Floral Friday Fotos meme, Aletta. Wonder of mens hul hier ook kry? Nog nie rerig gesien nie.Hier is gelukkig nie slange om weg te hou nie. Ja ek wonder of mens dit daar kry? Wens ons het nie slange gehad nie! Dis nogal vreemd om nie rerig slange en selfs akkedisse hier te sien nie. Baie dankie vir die baie interessante inligting, Aletta! Ons het n hele paar stoele wilde-knoffel in ons tuintjie, maar nooit geweet hul is so bruikbaar nie! Dis sommer ‘n groot plesier Dries! We used to grow this between our rose bushes In Johannesburg, to discourage aphids. That is a great use for them Sylvia!